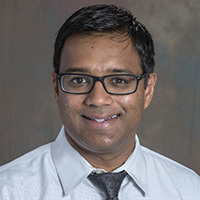 Nikhil Goyal, MD, is Assistant Professor in the Division of Cardiothoracic Imaging in the Department of Radiology and Imaging Sciences at Emory University School of Medicine. Dr. Goyal received his MD from Upstate Medical Center in Syracuse, New York. He completed an internship and his residency in radiology at North Shore University Hospital in Manhasset, New York. He also completed a fellowship at Massachusetts General Hospital in Boston, Massachusetts.